A relative newcomer in the glass body field, Les Dawes has made La Dawri Coachcraft, Box 2501, Long Beach, Calif. a name to reckon with. His shells feature some of the smoothest, and certainly the most original lines of bodies available to special builders. The La Dawri Conquest can be compared in size to the Corvette, and can actually be laminated to a Corvette chassis, using the existing floor, bulkheads, dash and interior decor. It fits wheelbases from 98 to 104 inches, and tread widths from 49 to 52 inches. Its younger brother, the Quest Q.T., is a miniature version of the Conquest. It is comparable in size with the 300-SL, and will fit wheelbases from 90 to 97 inches, and tread widths from 48 to 52 inches…i.e., M.G., Austin Healy, Triumph TRs, etc. The windshield frame is laminated over a steel roll bar, and is designed to take a stock late-model Chevrolet or GM windshield complete with chrome trim and frame. 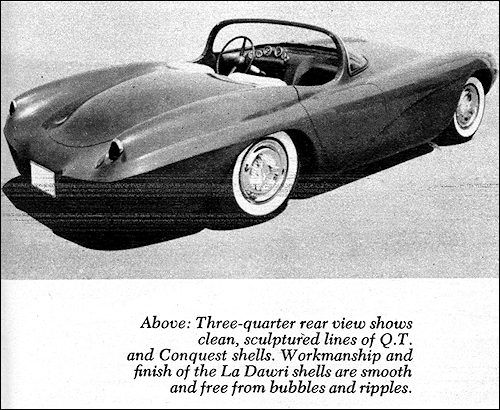 The Q.T., also with hidden roll bar, uses a stock Vauxhall unit. Bubbles cast into the shell, just forward of the windshield, need only to be drilled to accept a stock Studebaker electric windshield wiper assembly, with the motor bolted to the forward bulkhead. These units are offered in various states of completion beginning with kit 1A, which is the bare body shell along with templates for cutting the doors, trunk and hood. This unit requires some sanding along the seams where the 17 molds used to cast its sculptured shape meet. Otherwise, it is as sleek and glossy as a new refrigerator door! In this form the shell is priced at $395. 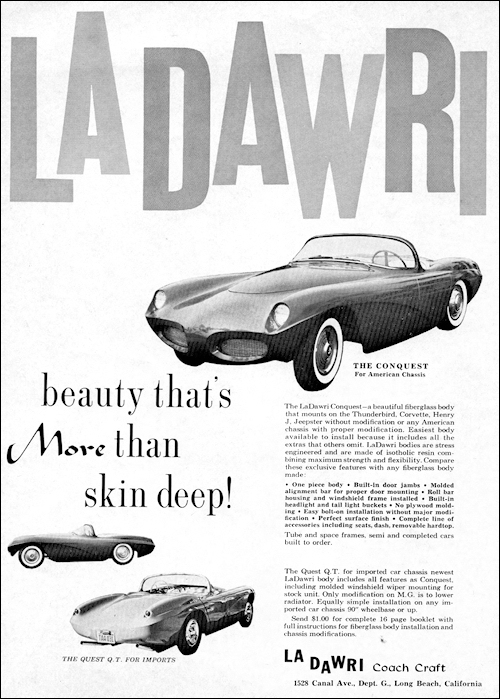 Although La Dawri will build a complete car, ready to run, these orders are handled on a custom basis. Their new ID kit is very close to being a completed car, however. It includes the finished shell, with trunk, hood and doors cut and hinged, rear bulkhead, door moldings, bench-type dash, and the whole works mounted on a Henry J tube-type frame and independent front suspension. The car is complete with floorboards, ready to be fitted with rolling gear. This kit is priced at $895. The Quest Q.T. is offered in two kits. Q.A. 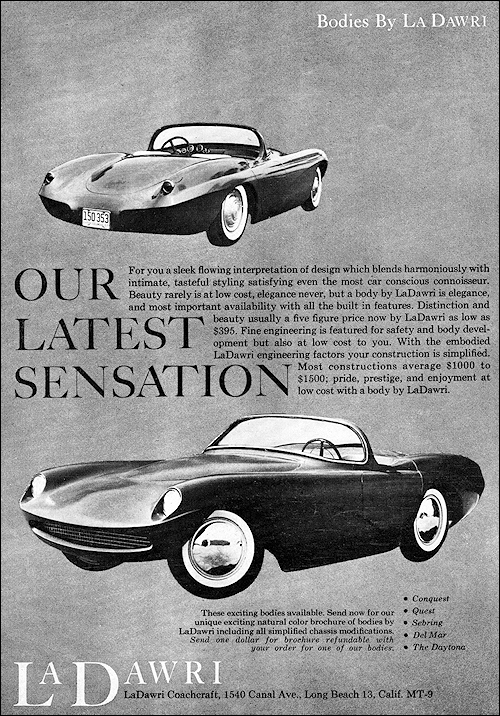 is similar to the Conquest 1A, with basic shell and its combination windshield frame and roll bar, independently molded hood, trunk and doors, which include molded door jambs and unique stiffening bar which holds the shell in shape until mounted, molded headlight bucket, and trimmed flashings. It is priced at $395. Kit #Q.B. includes the features of the above, plus hinges and locks mounted on hood, trunk and door units, a rear bulkhead, and the bench-type dash. It sells for $520. Accessories include a detachable hard top in kit or finished form, two dash designs; one for use with a three-seat bench which has a flat surface to accommodate any type instruments, and the other for two seaters, with the driveshaft tunnel sweeping up from the floor into the dash. This unit accepts Stewart-Warner speedometer, tachometer and four service gauges. A contoured airscoop is offered for carburetor clearance with forward-mounted, or extremely high motor positions. Several types of seats, including buckets, are also listed.